On the penultimate day of the 60th General Conference Session of Seventh-day Adventists in San Antonio, Texas, a significant moment slipped inconspicuously through the morning’s business session. The moment paralleled a speech made during the 2010 Atlanta General Conference Session that set off the Adventist Church’s most contentious fight of the last decade—the fight over women’s ordination. On July 1, 2010, during the 59th General Conference Session, Ray Hartwell, the President of the Pennsylvania Conference and a North American Division delegate, noted that the Adventist Church lacked a theology of ordination. Hartwell recommended that the denomination study the issue and establish a theology of ordination, which the General Conference Steering Committee agreed to do during the quinquennium ending in 2015. What followed was an at-times heated process that led to the vote on Wednesday, July 8, 2015 in which delegates refused to allow the church’s thirteen divisions to make provision for the ordination of women. Almost five years to the day after Hartwell’s ordination speech from the floor of the Georgia Dome, David Ripley, Ministerial Association Secretary for the Northern Asia-Pacific Division, stood on the floor of the Alamodome in San Antonio and made a nearly-identical speech about biblical hermeneutics. The morning’s business session agenda said “Church Manual,” but on the the day after contentious ordination vote, the session was punctuated by a calculated series of two-minute speeches on the need for greater representation from women and young Adventists in denominational leadership. Session Chair, outgoing Vice President Delbert Baker grew visibly frustrated. 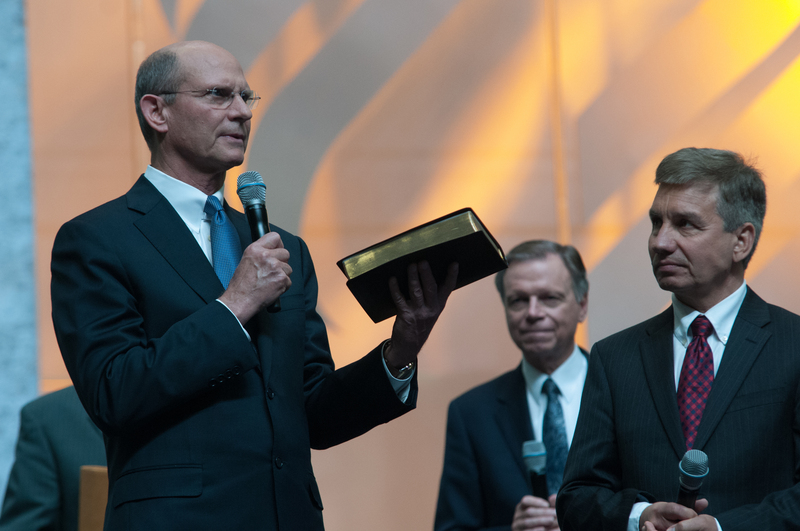 Further delaying discussion of the Church Manual, President Ted Wilson paid tribute to Pastor Doug Batchelor’s Amazing Facts media conglomerate on the occasion of the organization’s 50th anniversary. Wilson used the moment as an opportunity to share a note of appreciation for the Three Angels Broadcasting Network as well. To top off the free-wheeling discussion from the floor, two delegates attempted to introduce term limits for denominational administrators, something proposed and ignored with regularity at General Conference Sessions. Baker diligently avoided being diverted by the proposals coming from the floor, and when David Ripley took the mic to discuss hermeneutics, it appeared his remarks would be acknowledged and disregarded as well. However, Ripley would not be brushed aside. Noted that the Adventist Church lacked a unified biblical hermeneutic (methodology for interpreting Scripture), Ripley said that this more than any other issue divides the Adventist Church. He asked that the church conduct a study of hermeneutics to clarify the denomination’s method of biblical interpretation. Baker responded that Ripley’s concern had been noted and recorded, but Ripley was nonplussed. He insisted that General Conference leaders address the issue before the General Conference Session ended the following day. After a protracted back and forth, Baker told Ripley that he needed to make a motion to refer the item to the General Conference Steering Committee, which Ripley did. The motion was seconded and voted without discernible opposition. The following day, during the final business session, Undersecretary Myron Iseminger reported back to the body that the Steering Committee had considered Ripley’s recommendation, and in collaboration with the Biblical Research Institute, the General Conference would study the issue during the next quinquennium. On October 12, 1986 at the Annual Council Session in Rio de Janeiro, Brazil, the General Conference Executive Committee approved and voted a 3,364-word statement entitled “Methods of Bible Study” that lays out the very principles of interpretation that Ripley seemed to be asking for. “Even a modified use of this method that retains the principle of criticism which subordinates the Bible to human reason is unacceptable to Adventists,” the document states. The document provides assumptions about Scripture’s origins (“indivisible union of human and divine elements”) and its authority (“the clear, infallible revelation of God's will and His salvation”). Recognize that the Bible is its own interpreter and that the meaning of words, texts, and passages is best determined by diligently comparing scripture with scripture. Study the context of the passage under consideration by relating it to the sentences and paragraphs immediately preceding and following it. Try to relate the ideas of the passage to the line of thought of the entire Bible book. As far as possible ascertain the historical circumstances in which the passage was written by the biblical writers under the guidance of the Holy Spirit. Determine the literary type the author is using. Some biblical material is composed of parables, proverbs, allegories, psalms, and apocalyptic prophecies. Since many biblical writers presented much of their material as poetry, it is helpful to use a version of the Bible that presents this material in poetic style, for passages employing imagery are not to be interpreted in the same manner as prose. Recognize that a given biblical text may not conform in every detail to present-day literary categories. Be cautious not to force these categories in interpreting the meaning of the biblical text. It is a human tendency to find what one is looking for, even when the author did not intend such. Take note of grammar and sentence construction in order to discover the author's meaning. Study the key words of the passage by comparing their use in other parts of the Bible by means of a concordance and with the help of biblical lexicons and dictionaries. In connection with the study of the biblical text, explore the historical and cultural factors. Archaeology, anthropology, and history may contribute to understanding the meaning of the text. Seventh-day Adventists believe that God inspired Ellen G. White. Therefore, her expositions on any given Bible passage offer an inspired guide to the meaning of texts without exhausting their meaning or preempting the task of exegesis (for example, see Evangelism, 256; The Great Controversy, 193, 595;Testimonies, vol. 5, pp. 665, 682, 707-708; Counsels to Writers and Editors, 33-35). After studying as outlined above, turn to various commentaries and secondary helps such as scholarly works to see how others have dealt with the passage. Then carefully evaluate the different viewpoints expressed from the standpoint of Scripture as a whole. The Rio Document differentiates between non-apocalyptic and apocalyptic prophecies, it offers suggestions for reconciling passages that are seemingly in conflict, and says that “a background knowledge of Near Eastern culture is indispensable” for understanding particular phraseology found in Scripture. It is a strikingly thorough document. Stand firm for God’s Word as it is literally read and understood. Of course, we must always humbly recognize that we are finite, fallen creatures observing the works of an infinite, omnipotent God. There are things in both of God’s two great books of nature and Scripture that we do not fully comprehend. In fact, we are told that the sacrifice of Jesus will be “the science and the song of the redeemed throughout the ceaseless ages of eternity.” But that which the Lord in His mercy has given to us in clear language to be taken as fact simply because He said so must not be shrouded in skepticism. Don’t go backwards to misinterpret the first eleven chapters of Genesis or other areas of Scripture as allegorical or merely symbolic. As just this week we have once again affirmed in an overwhelming manner, the Seventh-day Adventist Church both teaches and believes in the biblical record of creation which took place recently, in six literal, consecutive, contiguous 24-hour days. While the Bible is paramount in our estimation as the ultimate authority and final arbiter of truth, the Spirit of Prophecy (referring to Ellen White’s writings) provides clear, inspired council to aid our application of Bible truth. It is a heaven-sent guide to instruct the church in how to carry out its mission. It is a reliable theological expositor of the Scriptures. If there is disagreement among Adventists on what the Church’s hermeneutic should be, it emerges most clearly in the contrast between President Wilson’s literalistic hermeneutic and the Rio Document’s comparatively robust use of exegetical tools and methodologies. Literalism is the one component missing from the Rio Document. It remains to be seen how the General Conference Executive Committee and the Biblical Research Institute will address David Ripley’s request. Will they initiate another process like the Theology of Ordination Study Committee, whose supermajority view that women should be allowed to be ordained had no bearing on the final outcome of the denomination’s five-year study of ordination? Will the BRI simply be tasked with revisiting and revising the Rio Document? However the issue is addressed, the one concern for the Wilson Administration not currently addressed in the Church’s statement on Bible Study is literalism, and if the Ordination study process provides any insight, its inclusion or exclusion could become the source of Adventism’s next great controversy.